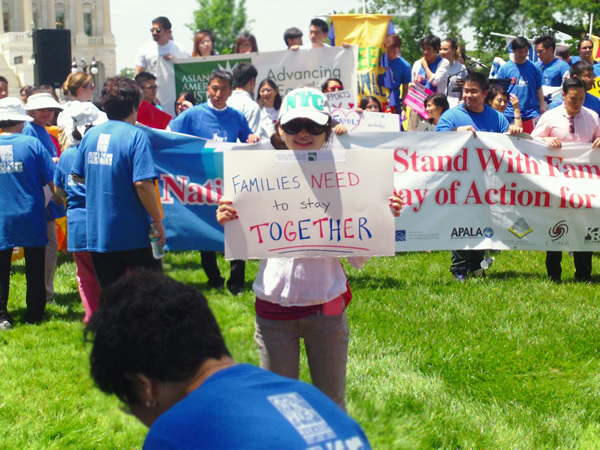 By: Jingru Huang On Wednesday, hundreds of Asian American and Pacific Islander (AAPI) families from 20 states rallied on the East Lawn of the Capitol to raise their voices in support of immigration reform. In my opinion, the reason Asian Americans are paid less attention than other nationalities in the immigration reform debate is because 90% of Asian immigrants come to the United States through family-based immigration visas. So the biggest problem that Asian immigrants face is backlog issues rather than allocation of citizenship. And although they have become the largest group of new immigrants in the U.S., the number of total Asian immigrants in the U.S. still does not compare to the number of Latino immigrants. As an Asian American, I think that no matter what your ethnic background, keeping families together is always the main concern. More of us should stand up and join the fight to protect the rights of immigrants. Families should be reunited regardless of race because family is the core of community, and strong communities are essential for the future of the United States. Of course there will be challenges that lie ahead of us, but I believe that we will rise up together to face those challenges and fight for a common cause as one people. Stand with families.